In a windowless conference room, Republican Senate candidate Martha McSally was asking executives at a small crane manufacturing company how the GOP tax cut has helped their business when one woman said: "I want to ask you a question about health care." Marylea Evans recounted how, decades ago, her husband had been unable to get health insurance after developing cancer, forcing the couple to sell some of their Texas ranch to pay for his treatment. Now she was worried about Democratic ads saying McSally, currently a congresswoman, supported legislation removing the requirement that insurers cover people with pre-existing medical conditions. "It's a lie," McSally said quickly, accustomed to having to interrupt a discussion of the tax cut to parry attacks on health care. But she had voted for a wide-ranging bill that would have, among other things, undermined protections for people with pre-existing conditions and drastically changed and shrunk Medicaid. The exchange demonstrated how Democratic arguments about health care are resonating with voters in the final weeks before the midterm elections. While Democratic enthusiasm this year has largely been fueled by anger toward President Donald Trump, candidates have targeted their messaging to focus more on health care. It's the subject of the greatest share of political ads on television now, according to a Wall Street Journal analysis, and a top issue in campaigns from Virginia to Arkansas to California — and especially in Arizona, where Democratic Rep. Kyrsten Sinema has made it the foundation of her Senate campaign against McSally. "Democrats believe that health care is the issue that's going to deliver them the majority," said Nathan Gonzalez, editor and publisher of the nonpartisan Inside Elections. "In 2016, Democrats learned that going all-in against Trump was not the right strategy, so they're trying to be more specific." The Democratic furor around health care comes from Trump's push to repeal the President Barack Obama's Affordable Care Act. House Republicans voted for a bill that would have rolled back parts of "Obamacare." But the Senate never took up the bill, and its own attempt to reverse the health care law failed by one vote. This year, the Trump administration supported a group of GOP attorneys general who filed a lawsuit arguing "Obamacare" is unconstitutional. The administration singled out protection for pre-existing conditions as unsustainable. Democrats are effectively performing political judo on the GOP, who accused them over four election cycles of messing up voters' health care with "Obamacare" and vowed a hasty repeal once they were back in power. Now that the GOP tried and failed to change health care, Democrats are pouncing. "You see in every survey, whether it's a Senate race in a red state or a House race in a purple district, health care is the No. 1 issue," said Patrick McHugh of Priorities USA, a major Democratic campaign group. "One party wants to actually expand health care coverage and reduce costs, and the other party campaigned claiming they did, but when they got into power, they did not." In Missouri, Democratic Sen. Claire McCaskill is defending her seat by highlighting that her Republican challenger, state Attorney General Josh Hawley, signed onto the lawsuit over pre-existing conditions. In Michigan, Democrat Elissa Slotkin aired an ad showing her mother dying of cancer and called incumbent Republican Rep. Mike Bishop's vote for the GOP health bill "dereliction of duty." In Arizona, Democrat Hiral Tipirneni, a physician, is running against Republican Rep. Debbie Lesko after shocking the political world by barely losing an April special election for the seat on a health care platform. Glen Bolger, a Republican pollster, notes that health care is a perennial Democratic base issue but acknowledges it appears especially potent this year. However, he said, Republicans have a possible counter — pushing back against some Democrats' support for a single-payer system that would require higher taxes. "That, as a pushback message, tests very well," Bolger said. Republicans have used it in races where Democratic challengers have backed the policy — such as against Katie Porter, an attorney challenging Republican Rep. Mimi Walters in Southern California, or against social worker Kara Eastman, who's leaned heavily on single payer in her challenge to Rep. Don Bacon in Nebraska. The GOP has even levied the charge against Democrats who haven't supported a single-payer program, like Abigail Spanberger, who's challenging Rep. David Brat in Virginia. Gonzalez said the GOP responses show they're fighting on Democrats' turf and keeping the GOP from cashing in politically on the growing economy. "Democrats believe that health care is the antidote to Republican talk about the economy," he said. The Arizona Senate contest provides a microcosm of the issue. Democrats started hitting McSally on health care with an ad barrage from a dark-money group during the GOP primary and have not let up, accusing her of trying to gut protections for pre-existing conditions and charge older people more for health insurance. Sinema mentions the issue everywhere she goes. In an interview with the Spanish-language Univision network Wednesday, she called it "the centerpiece of my campaign." 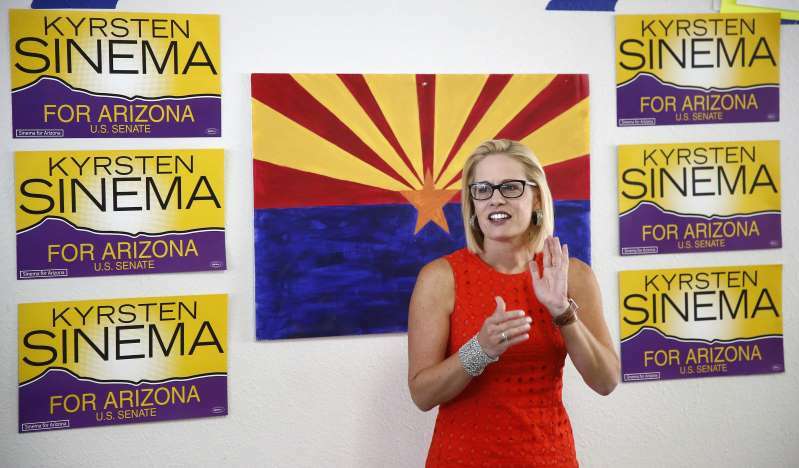 At a recent appearance to rally volunteers in Scottsdale, Sinema was introduced by Leslie Foldy, a 64-year-old court reporter. "I've had diabetes since high school. I've been taking insulin shots ... for the past 47 years," Foldy said. Sinema picked up the theme and ran with it. "We have a chance to elect a United States senator who understands Leslie's struggles to make sure she gets access to the important medication she needs and that she's not discriminated against because of having a pre-existing health condition," she said. It was a dig at the GOP health bill that McSally supported for containing what she calls an "age tax" — a provision allowing insurance companies to charge people ages 50 to 64 who buy insurance on health exchanges rates five times higher than younger consumers. Under the ACA, the limit is three times higher. In an interview, Sinema described her health care agenda as mainly a fight to preserve popular parts of "Obamacare." She said she didn't like everything about the bill and noted she'd sponsored bills delaying or repealing some of its funding mechanisms — taxes on medical devices and health insurance. McSally instead focuses on the shortcomings of the law, blaming it for driving up health premiums for small businesses and other consumers and arguing Republicans are just trying to make things better. She bristles at the "age tax" attacks because she wrote an amendment adding $90 billion in subsidies for older consumers to protect against higher insurance rates. Although the GOP health bill did contain provisions that weakened the ACA's protections of pre-existing conditions, McSally calls pre-existing conditions "a line in the sand" that she'll protect. "We've all got people in our lives who struggle with chronic disease," McSally said. "It's personal for all of us. The Democrats are taking this line of attack because they know health care is personal."